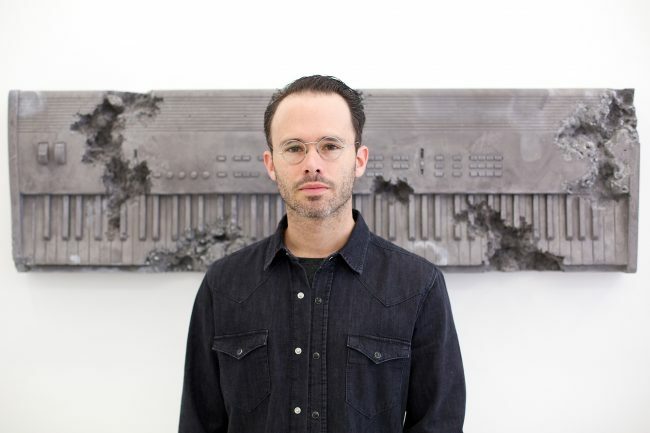 New York based artist Daniel Arsham straddles the line between art, architecture, performance, and film. Raised in Miami, Arsham attended the Cooper Union in New York City where he received the Gelman Trust Fellowship Award in 2003. Architecture is a prevalent subject throughout his work; environments with eroded walls and stairs going nowhere, landscapes where nature overrides structures, and a general sense of playfulness within existing architecture. Arsham makes architecture do things it is not supposed to do, mining everyday experience for opportunities to confuse and confound our expectations of space and form. Simple yet paradoxical gestures dominate his sculptural work: a façade that appears to billow in the wind, a figure wrapped up in the surface of a wall, a contemporary object cast in volcanic ash as if it was found on some future archeological site.